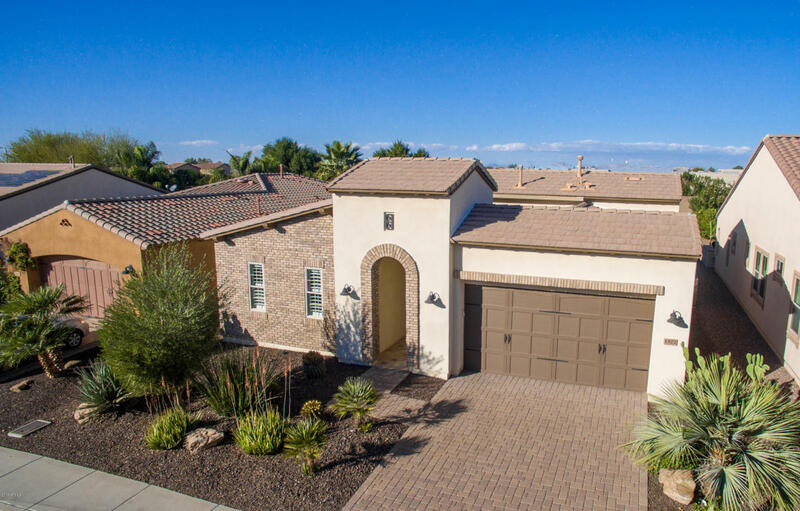 Beautiful Positano plan w/a pristine & very private rear yard that has attention to detail everywhere! This unique home offers an interior courtyard with 2 rolling walls of glass & a gas outdoor fireplace. Entertain your family & friends in the spacious kitchen w/upgraded cabinets, gas cook-top & beautiful tile back splash. This home also features beautiful detailed tile flooring inside & out You will love spending time in the rear yard that is private & pristine. Enjoy all the features - the BBQ grill, putting green & fire pit. A wonderful Custom water feature adds the perfect touch to this unique backyard! Come enjoy the resort lifestyle Encanterra offers - Clubhouse w/Restaurant, Workout Facilities, Spa, Swimming Pools, Tennis & Pickle Ball, Bocce Ball & Private Golf Course. A MUST SEE!